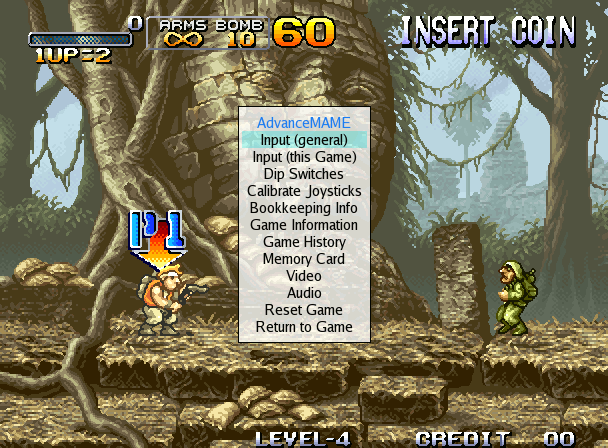 These are some examples of the revised user interface of AdvanceMAME. This is the main menu of AdvanceMAME. The menu uses TrueType font with alpha blending and a complete color customization. To show the menu press the TAB key. This is the video menu where it's possibile to select the various video parameters. The options on the right are the user requests. The options on [ ] are the current settings. The firstline display the size in pixels, the color depth, the horizontal frequency and the vertical frequency used. 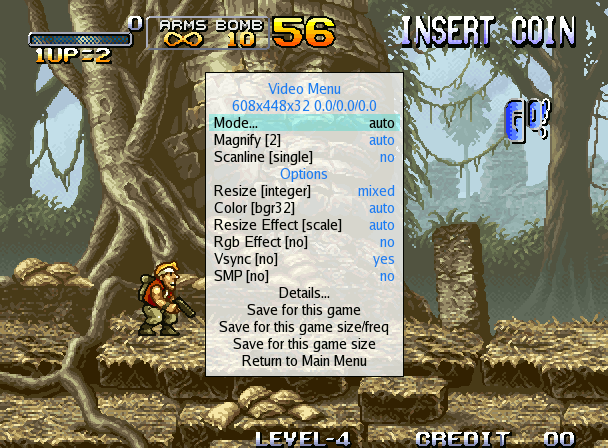 The Mode option selects the current video mode. The best is automatically choosen by the auto option. The Magnify option selects the magnify factor to use: 1 or 2. The Scanline option selects the hardware scanline mode: single or double. These are not fake scanline, they are true hardware scanline. The Resize option limits the possible stretching: no, integer, mixed or fractional. 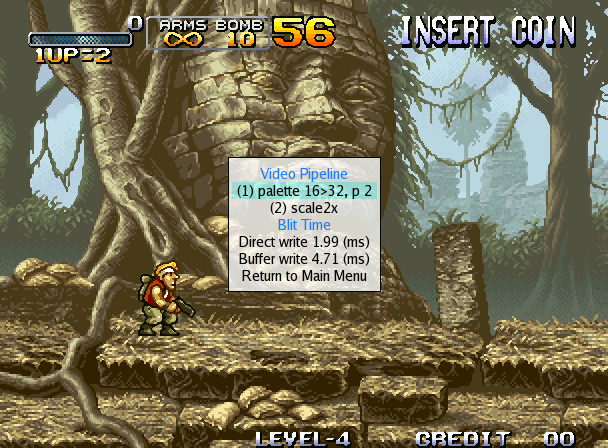 The Color option selects the color mode: palette or RGB. The Resize Effect option selects one of the special graphical effects to improve the image quality. One of : no, max, mean, filter, scale, lq and hq. 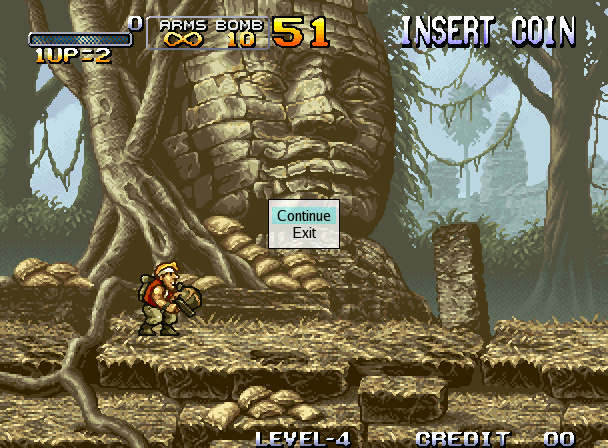 The Rgb Effect option selects one of the special RGB effects to simulate the aspect of the old Arcade Monitors. One of : no, triad3dot, triad6dot, triad16dot, scan2horz, scan3horz, scan2vert, scan3vert. The Vsync option selects the wait mode to use. The SMP option enables the use of a Multiprocessor CPU for the final video blit. When the best setting are found they can be saved for the current game or for all the games that have the same resolution. The Details menu show the blit pipeline and the blit time. 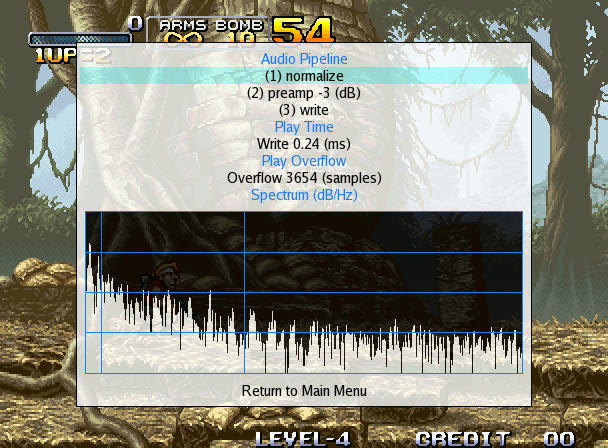 This is the audio menu where it's possibile to select the various audio parameters. 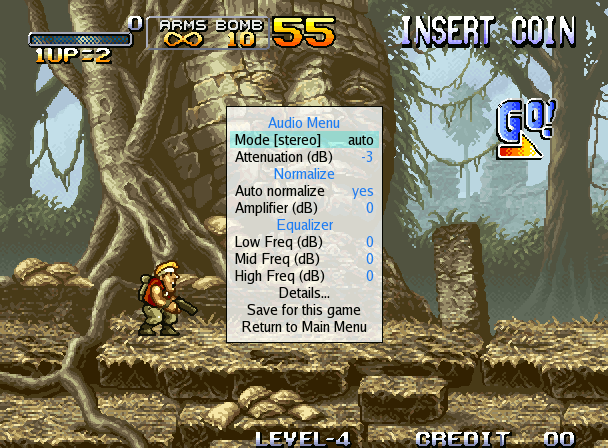 The Mode option selects the current audio mode. You can use mono, stereo and surround. The Attenuation option control the output volume. The Auto normalize option enables the automatic volume control which use the Fletcher-Munson "Equal Loudness Courve" to estimate the correct loudness. The Amplifier option selects the current audio amplification. The Equalizer options allow to equalize the audio output. When the best setting are found they can be saved for the current game. The Details menu show the audio pipeline, the audio processing time, the incremental number of clipped audio samples and a spectral analysis of the current audio output. 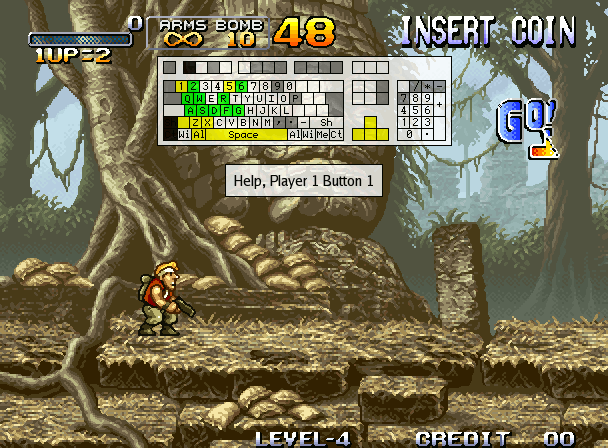 This is the help screen where you can see the available buttons for each player. You can also customize the control image to match your control panel. To show the Help screem press the F1 key. This is the menu shown when the SafeExit option is activated and you press the ESC button. This option prevents any casual exit from the emulator.